LAWRENCE, Kan. (AP) — Kansas is accustomed to muddling through long losing streaks in the Big 12. It’s a much rarer and just as unwelcome occurrence for TCU. The Horned Frogs have dropped two straight and four of their last five, including last week’s blowout loss to Oklahoma. Their most dynamic playmaker was just booted off the team and, at 3-4 and 1-3 in the Big 12, coach Gary Patterson’s team faces a tough road to reach bowl eligibility. That path begins with Saturday’s visit to the Jayhawks. Winning is more fun than some of the stuff Patterson has dealt with this week. On Tuesday, he announced that wide receiver KaVontae Turpin had been dismissed from the team following an assault charge over the weekend. Turpin has three touchdown receptions this season, led the nation in punt returns and had a 99-yard kickoff return against the Sooners. That decision came a day after Patterson announced that quarterback Shawn Robinson will have season-ending surgery. Michael Collins will take over after playing well at times against Oklahoma. Oh, and starting corners Julius Lewis and Jeff Gladney may or may not play this week. 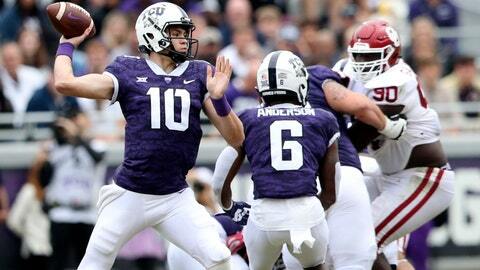 The Horned Frogs have the perfect get-right opponent coming up in Kansas. The Jayhawks (2-5, 0-4) have lost four straight after a blowout win over Rutgers. Along the way, coach David Beaty fired offensive coordinator Doug Meacham and has continued to go back and forth with his starting quarterbacks, preventing the Jayhawks from finding any offensive rhythm. “It’s going to be a challenge, but our guys are certainly up for it and coming out of last week the things that we need to fix are very fixable,” Beaty said. “I know that our procedure is much improved. I know our guys feel much more comfortable. TCU blew out the Jayhawks 43-0, but most of their recent contests have been relatively close. The Horned Frogs won 24-23 the last time they were in Lawrence, and four of the past five games have been decided by 10 points or fewer. Kansas safety Mike Lee was tossed from last week’s loss to Texas Tech for targeting, and he was fairly honest about what he did upon returning to the locker room. The Jayhawks haven’t played at home since losing to Oklahoma State on Sept. 29. They had road games against West Virginia and the Red Raiders sandwiched around a week off.